Here’s what’s inside then box. Here’s a few shots of Grimlock in the robot mode. 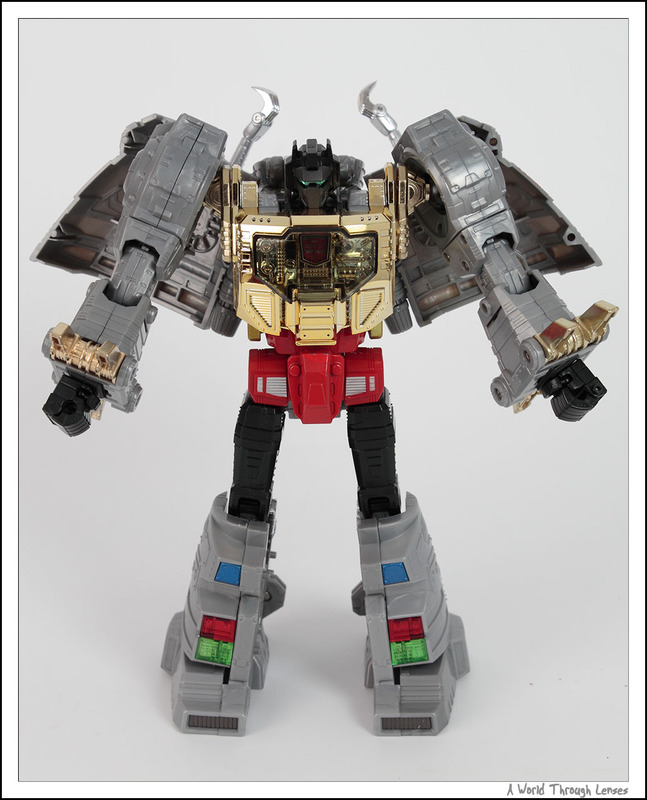 The details on the chest and all the panels on the legs. 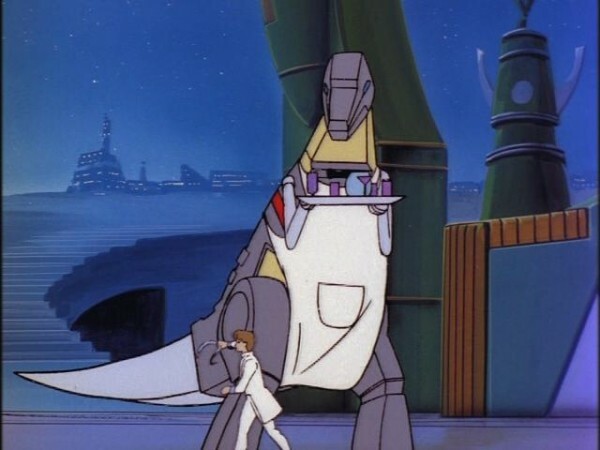 Transformed into the dinosaur mode. 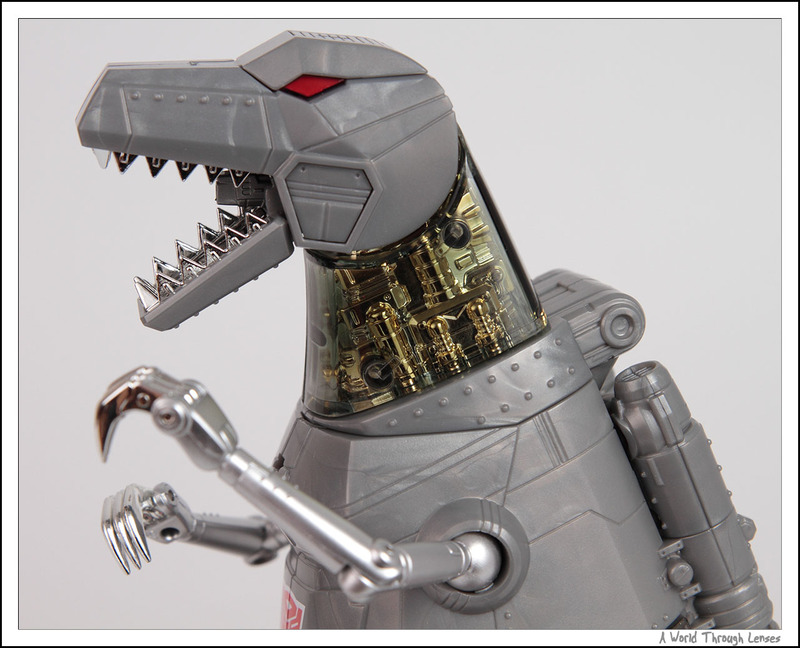 The T-Rex front claws have individual fingers allowing you to move them independently. 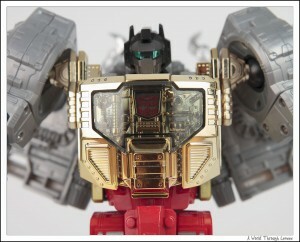 There’s a mechanism on the head to switch between blue and red eyes. 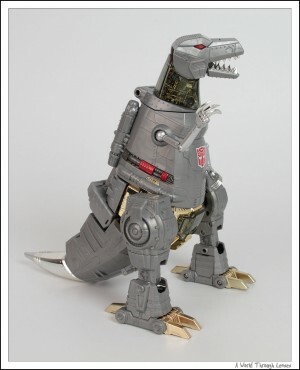 The original Generation 1 Grimlock toys comes with red eyes I think. 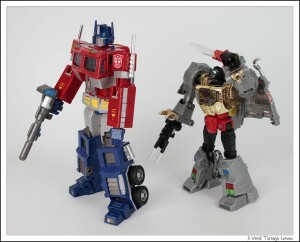 But it’s good to be able to switch between the Decepticons’ red eyes and Autobots’ blue eyes. 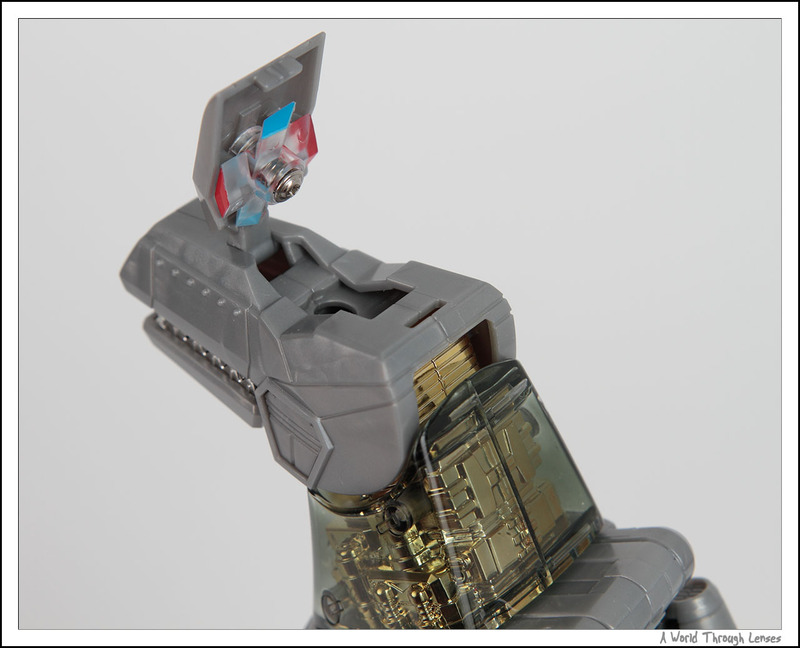 The neck is incredibly detailed a transparent plastic covering showing off all that lies underneath. 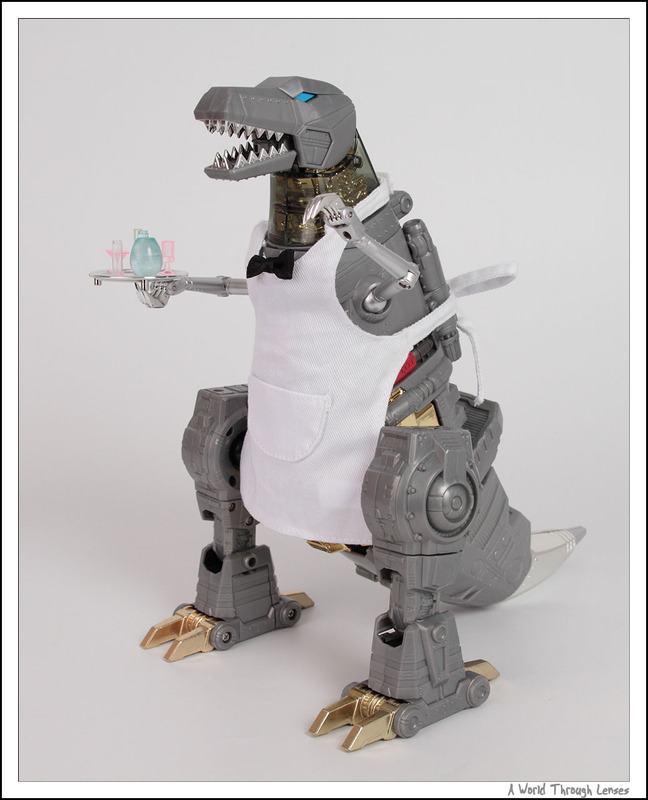 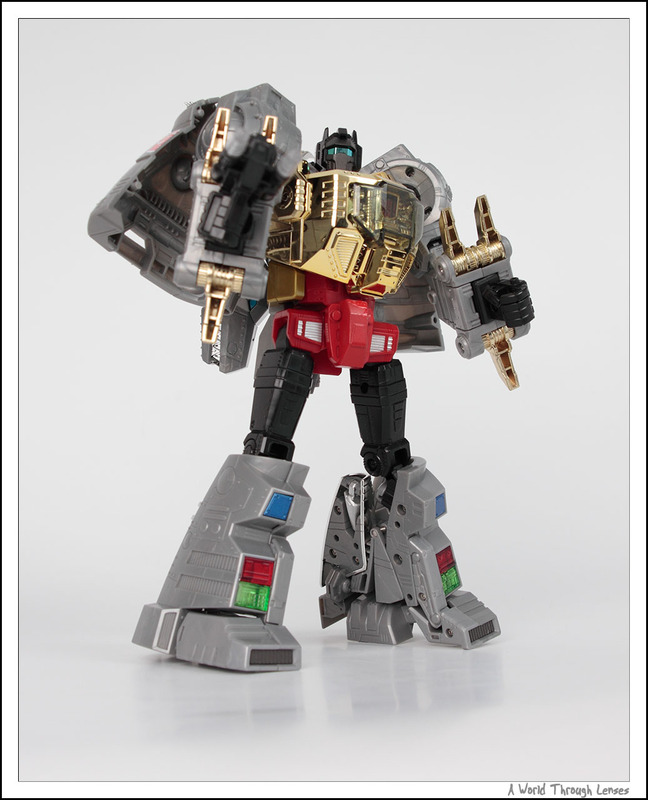 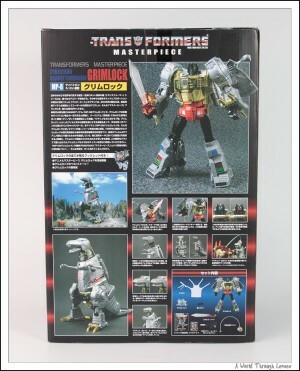 Comes with the apron and bow-tie to dress up as the waiter Grimlock. Arrrr…. too many orders. Grimlock is mad. 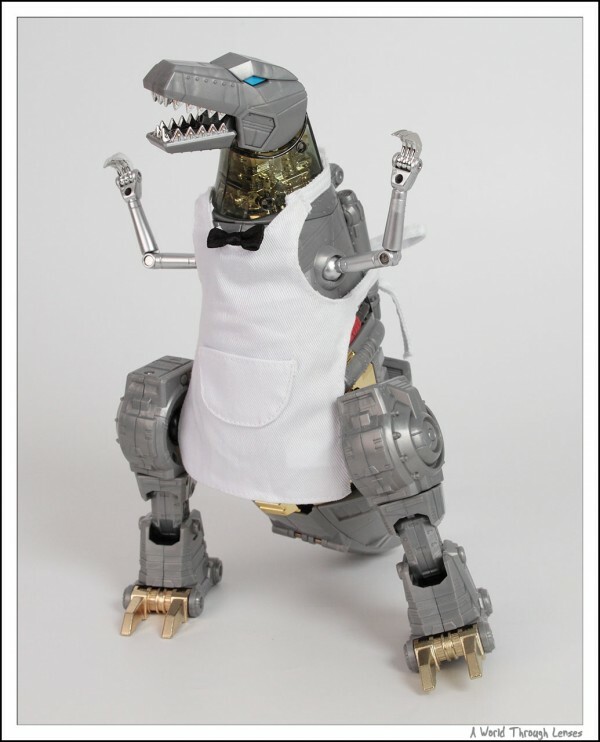 Just in case you wondering what’s with Grimlock and the apron, well here’s a screen shot of Grimlock in waiter form in the animated series. 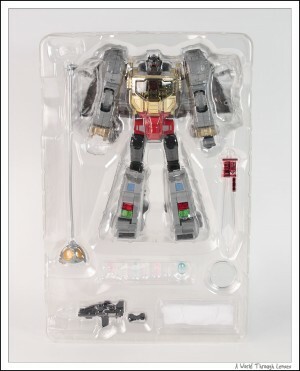 Also comes with the brain transfer device. 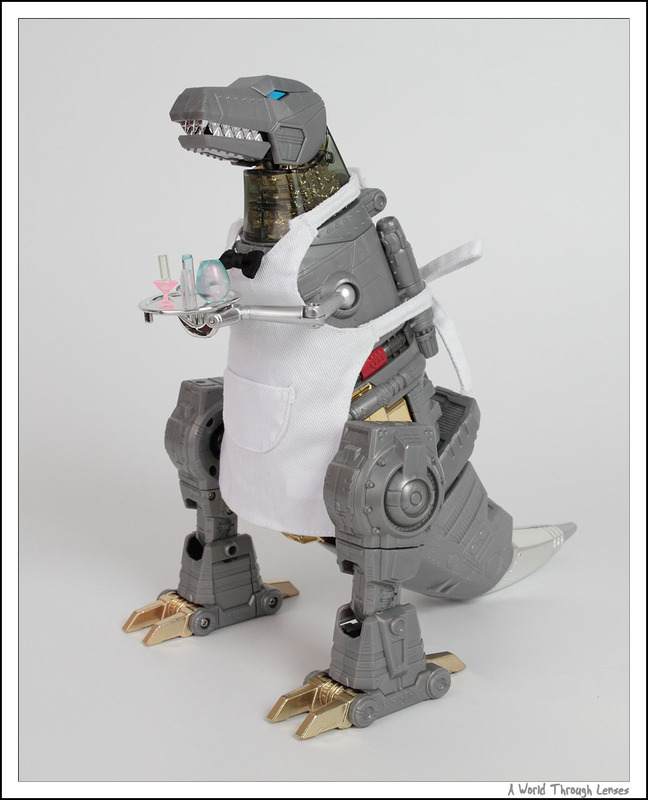 Hmmmm…. Grimlock trying it out on Optimus Prime. Yes Optimus, you will be as smart as me soon. 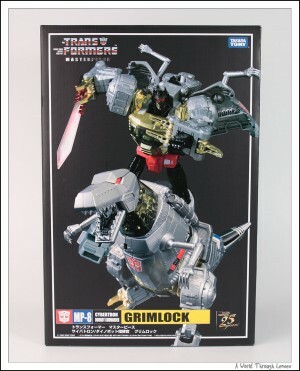 Here’s the weapons that comes with Grimlock. 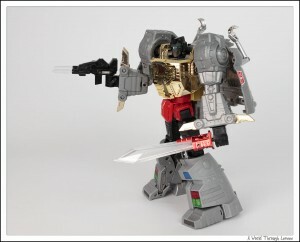 The blaster lights up so does the sword when placed in his right hand. The left hand has a special design so that you can securely put the sword in the left hand for dual wielding. 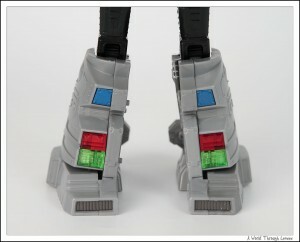 But on the left hand, the sword won’t light up any more since the LED light is on the right hand. 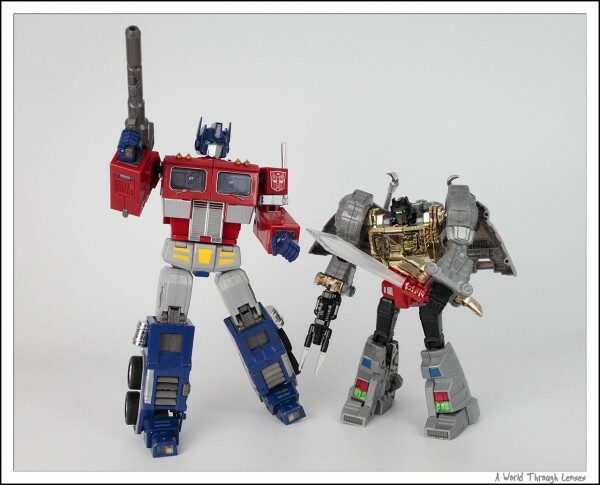 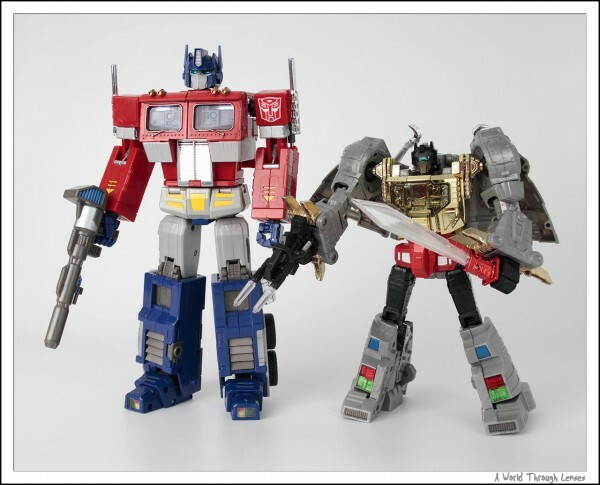 A little comparison with Masterpiece Optimus Prime. 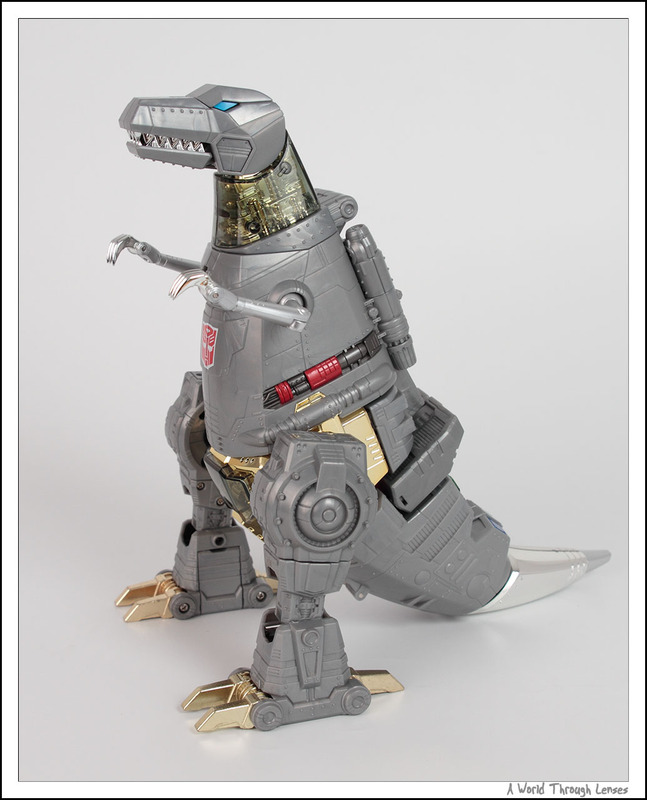 Grimlock stands a fair bit shorter and is light being it is made mostly of plastic parts. 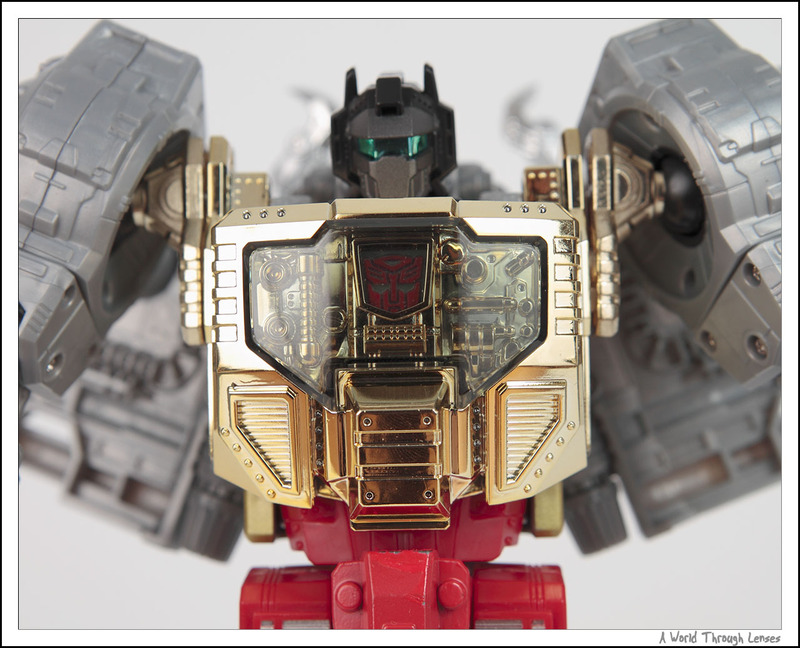 Not as pose-able as Optimus Prime but otherwise a high quality toy. 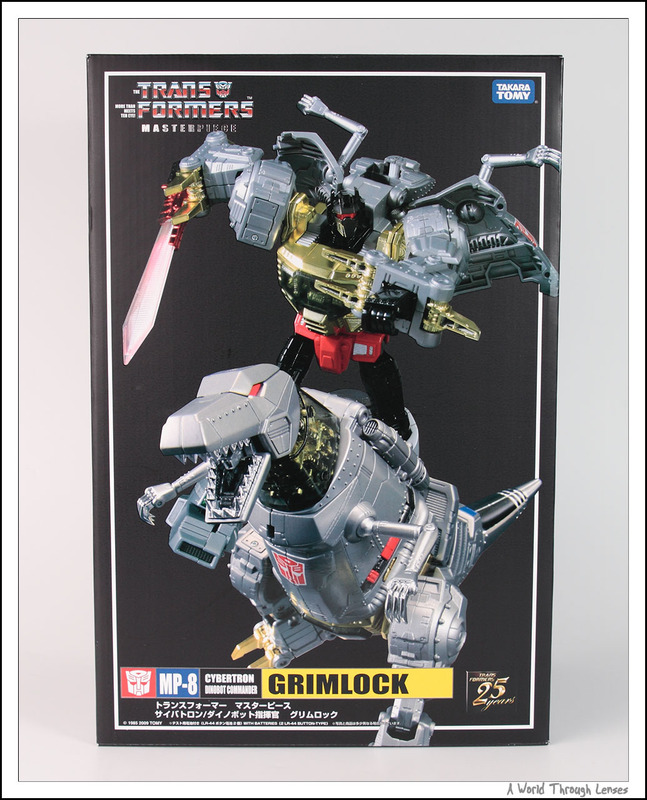 I don’t really mind Grimlock not being so pose-able in the robot mode, after all Grimlock is much cooler in the dinosaur mode. Now I can only wish only if Takara Tomy make other Dinobots as a masterpiece transformers toys too. 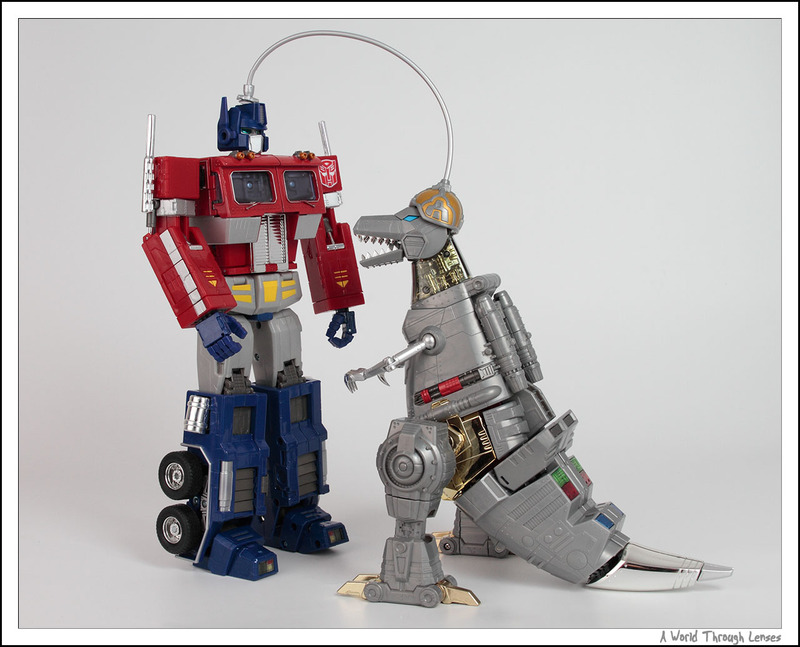 Having a bit fun with Grimlock and Optimus Prime. 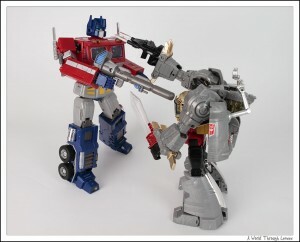 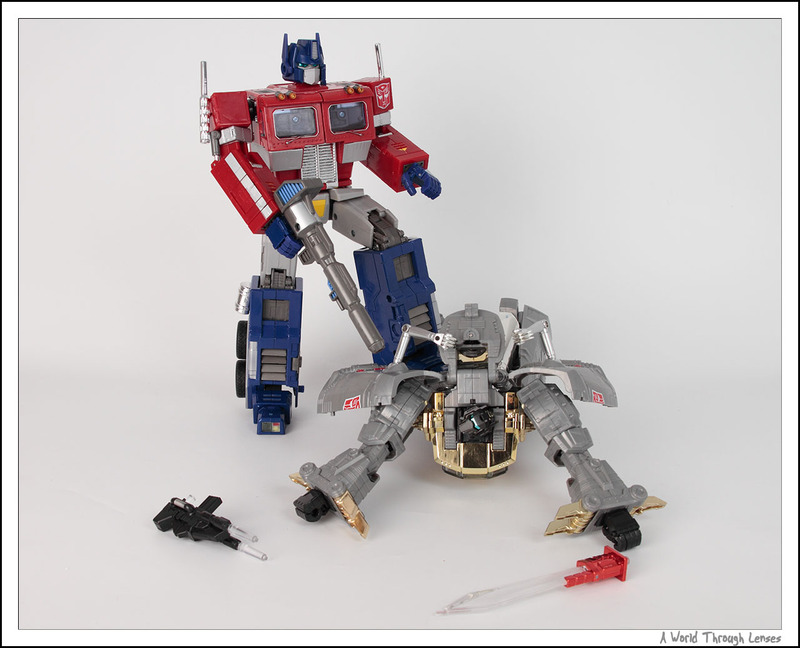 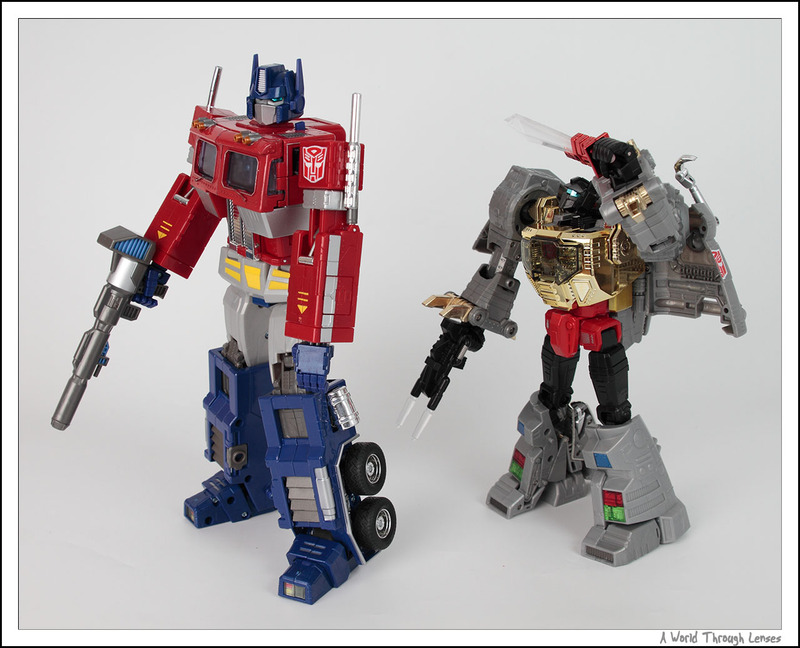 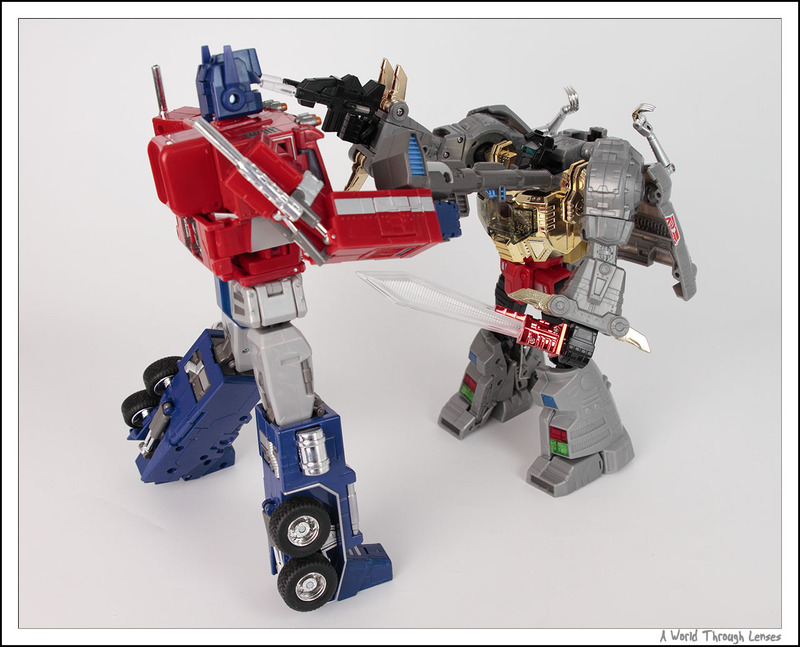 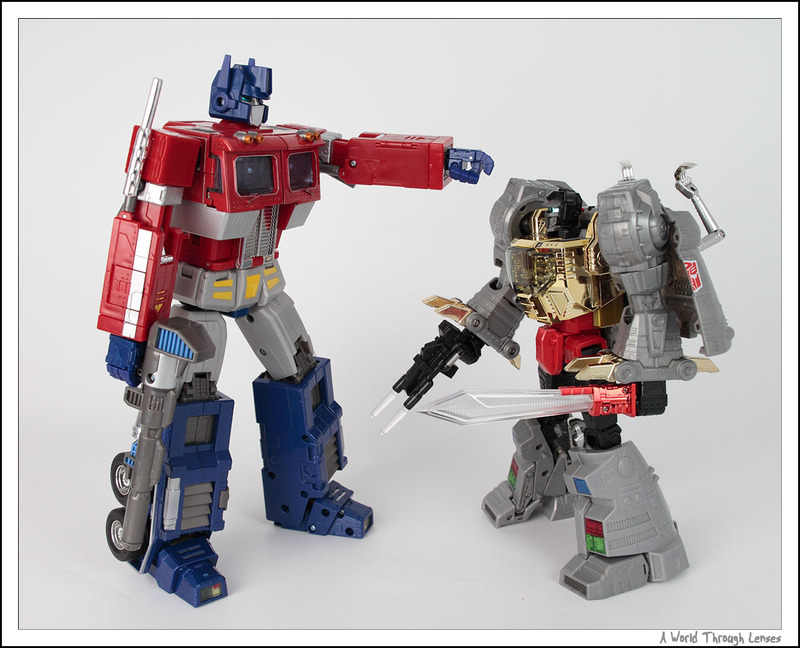 Grimlock: Optimus, look, I got a cool looking sword. 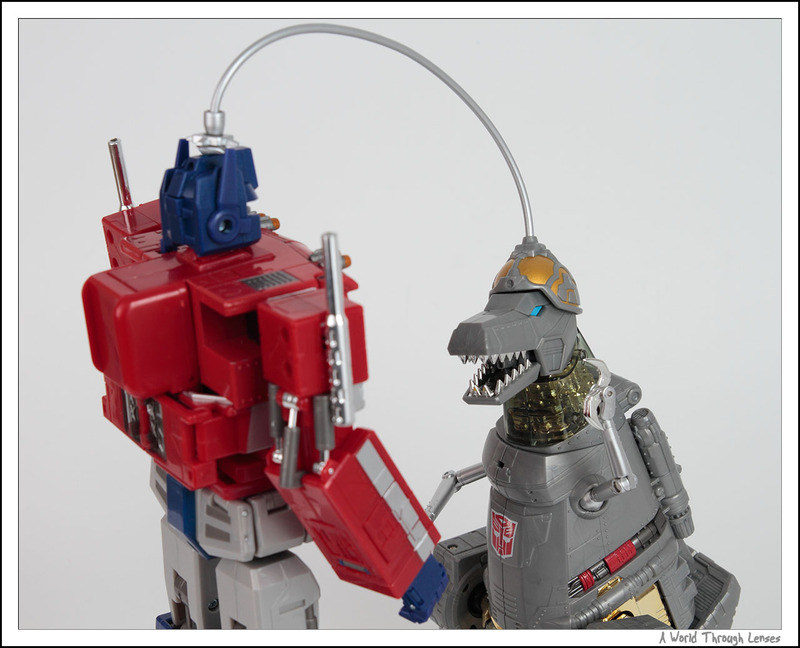 Optimus: Now stop playing around Grimlock, don’t you have important work to do, and drinks to serve? 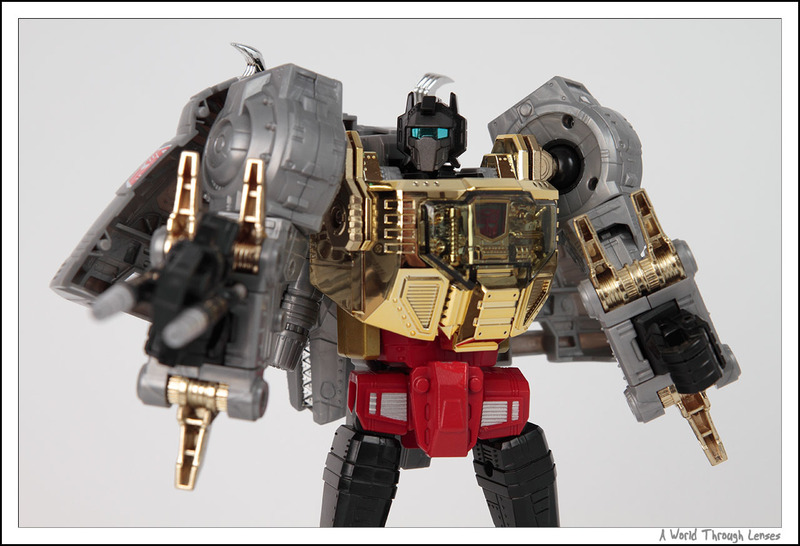 Grimlock: Yeah, well how about I serve you with my other cool looking blaster? Optimus: Now there, I don’t think you want to pick a fight with me. 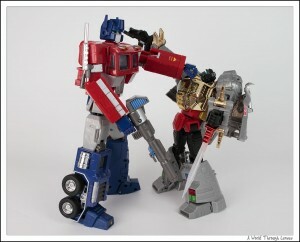 Optimus: That got to teach you a lesson about not to mess with the Primes. Optimus: Now, get back to work, I’ve got more important task to do. 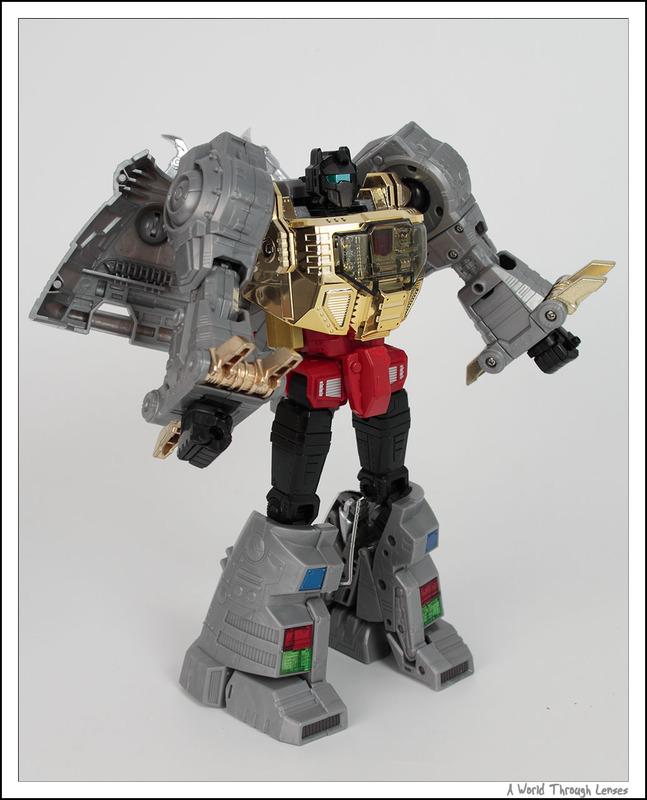 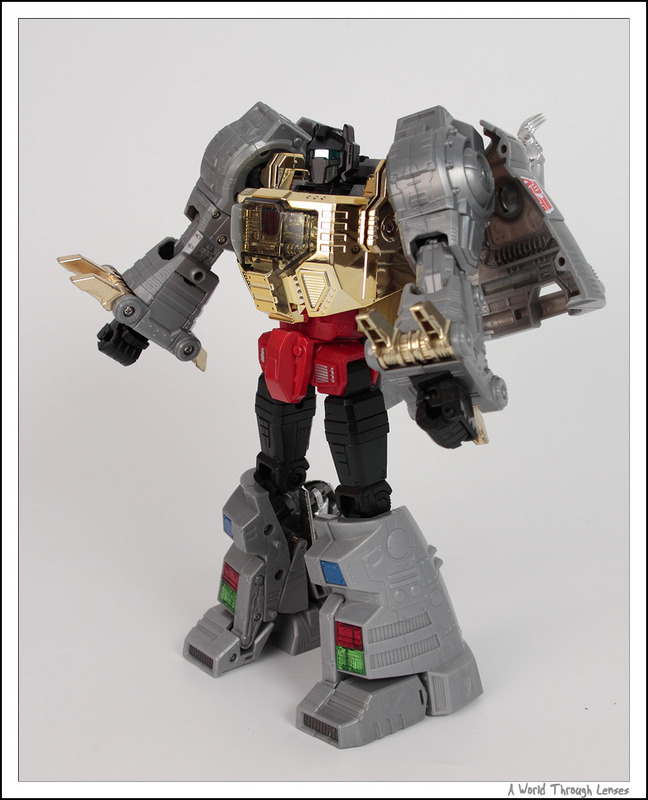 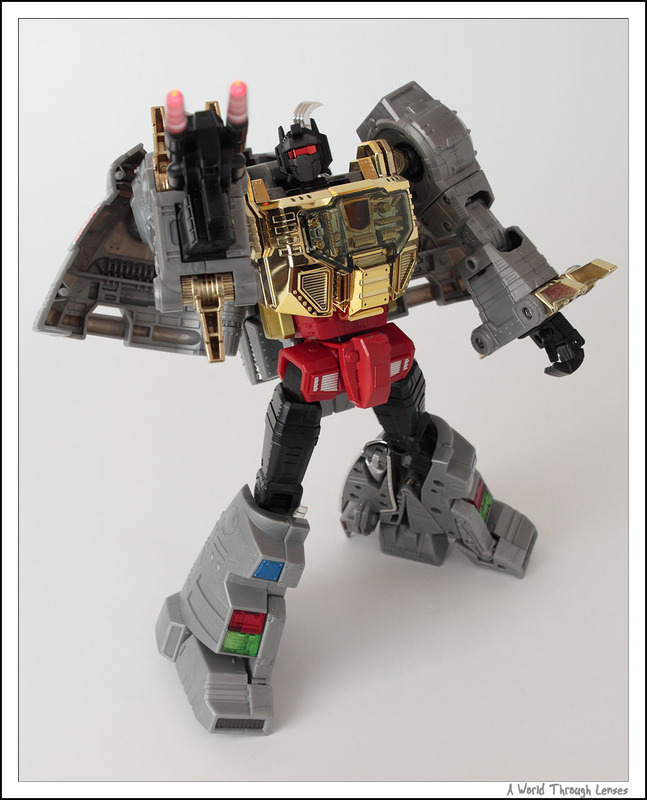 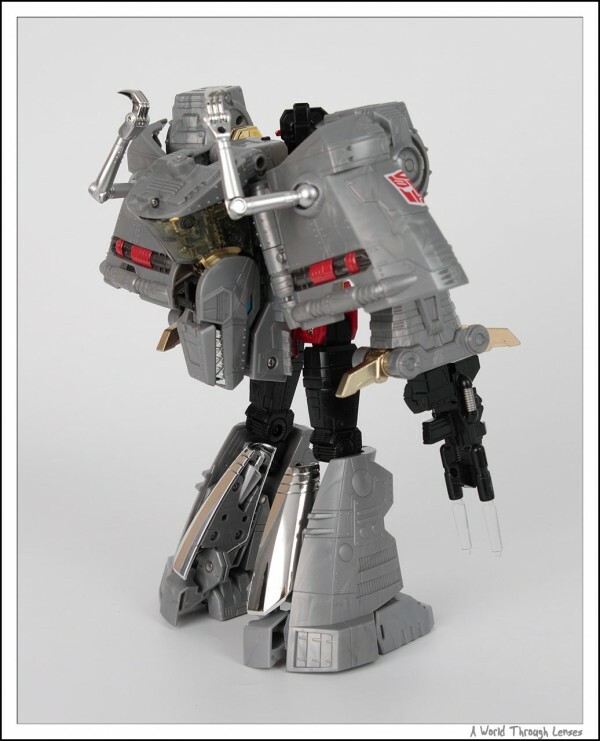 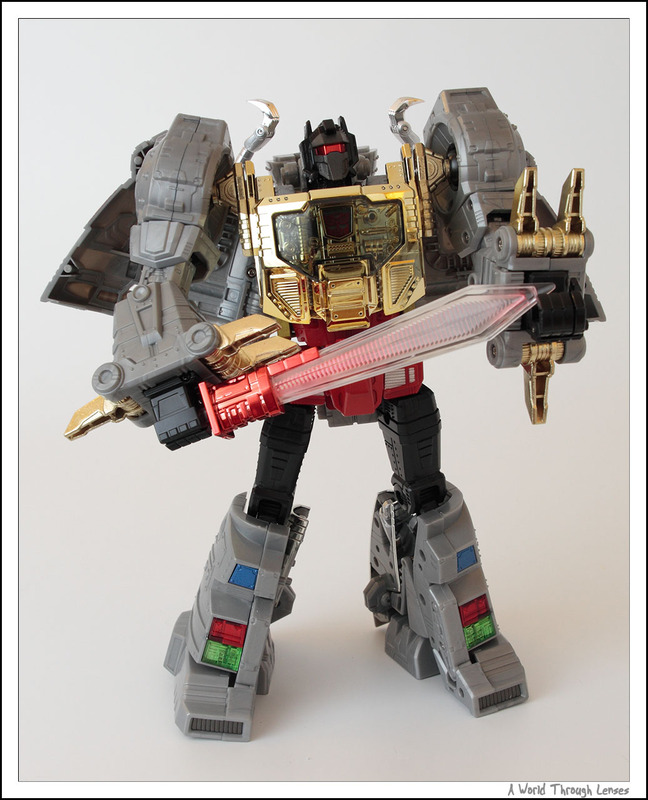 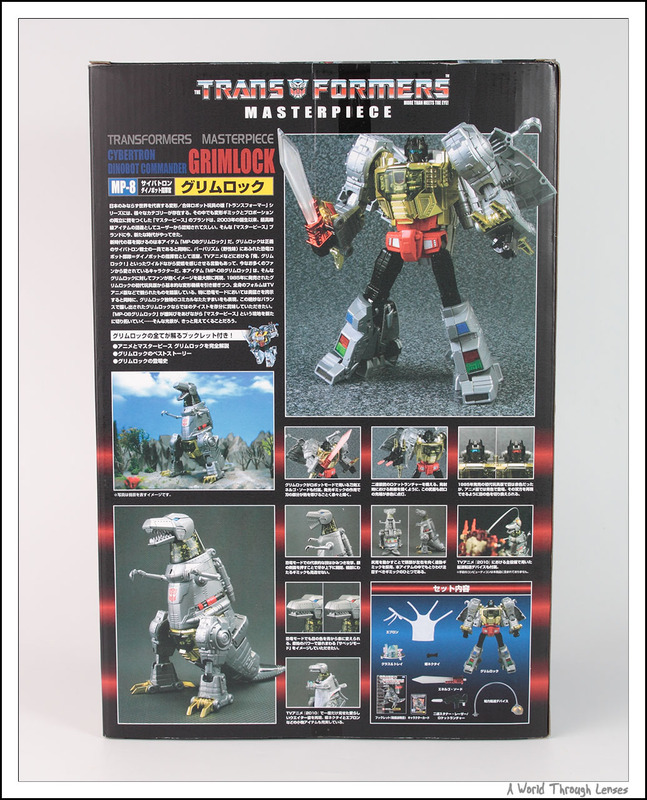 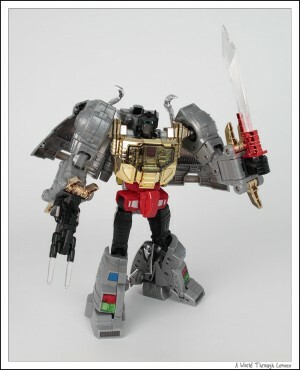 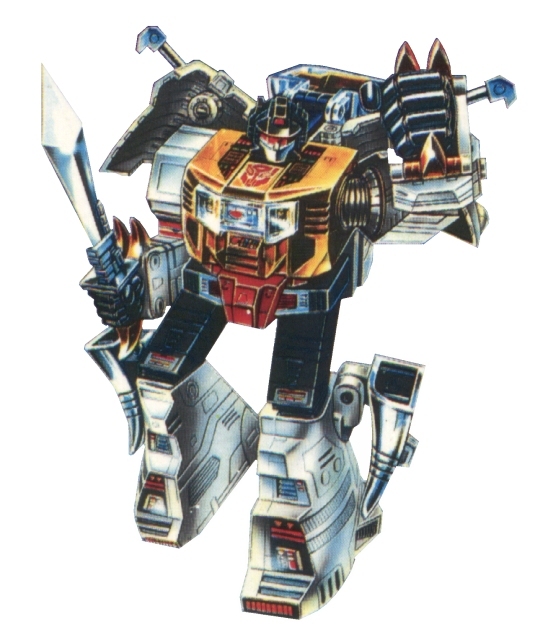 As for a 2D comparison, here’s the only illustration I can find of Grimlock.